There you are, absent-mindedly dismissing notifications from your lock screen, when all of a sudden you think you might have swiped away something that was hugely important. Or was it? Here's how you can access your notification history in the most recent versions of Android. In Lollipop, press and hold on a blank part of the home screen to bring up the Widgets option and tap it—the one you want is labelled Settings shortcut. 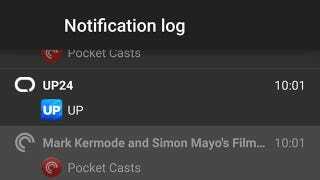 Drag this to a spot somewhere on your phone's home screens and you'll be asked which settings screen you want to link to, so choose Notification log from the list. And there you have it. Tapping on your newly created shortcut will take you to a long list of notifications, with the most recent at the top—tap through on any entry and you'll be taken to the relevant App info screen. You might want to keep the shortcut widget in place just in case you ever dismiss an alert without reading it properly.